Vocational and trade professions form the backbone of Alabama's economy. Extensive workforce development initiatives in Alabama bring career-specific vocational and trade education to high school and adult learners, while the state’s community colleges provide career and technical education (CTE) to post-secondary students. 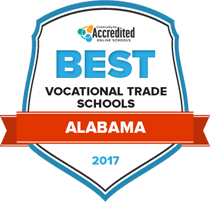 With the education and training provided by Alabama’s vocational schools, students are prepared for skilled occupations in numerous trade industries. This guide informs prospective students of their options for vocational and trade schools in Alabama. Alabama provides a wide range of vocational and trade schools for students looking to work right after college. Vocational programs can be found in trade schools, career colleges, and community colleges and cover many different programs such as allied health, web development and electrician training. The following list of accredited schools are ranked based various factors such as financial aid availability, tuition and number of programs offered. At Gadsden State, students can choose among a career-focused range of two-year technical/vocational programs in the engineering disciplines. Vocational studies programs include specializations in automotive manufacturing, HVAC, drafting and design, machine tool technology, electrical and electronic engineering. Specialized curriculum also features studies in carpentry, auto collision repair and welding technology. Part of the Alabama Community College System, Gadsden State also serves undergraduates with technical certificates (3-4 semesters), and 26-hour, short-term technical certificates. Students interested in completing an associate of applied science in a technical field must complete seven academic courses in five semesters. The Allied Health and Technologies Division at Trenholm State Community College is one of the school’s more popular career programs. Its students choose among career-oriented studies in dental assisting technology, ultrasound, medical assisting, radiologic technology, therapeutic massage and practical nursing. Trenholm State’s automotive programs feature courses in collision repair, truck driver training, and diesel technology. Vocational students in engineering technologies can pursue competencies in HVAC, machine tool technology, drafting and design, and welding. Business students can choose among career courses in accounting, bookkeeping and payroll management. Trenholm State also operates a GED completion program for adult students. As a member of the Alabama state system of community, junior, and technical colleges, Bevill State is dedicated to workplace training and retraining through its basic skills and occupational development curriculum. Programs offered through The Career Technical Education Division let students choose among short and long-term certificates, Applied Science (AAS) degrees, and certificates of completion. Vocational programs include cosmetology, AC and refrigeration, computer science, drafting design, machine tool technology, business office management, welding, mining technology, truck driver training and vehicle repair. Students do not need a high school diploma or GED to enroll in the vocational programs. At Birmingham’s Lawson State Community College, vocational students can take online, on-campus and hybrid career classes in technical and health profession training programs. To serve the growing trade professions in the automotive sector, LSCC directs The Alabama Center for Automotive Excellence. The center is host to vocational preparation courses in auto body repair, automotive technology, and repair specializations in Ford, General Motors, and Toyota cars and trucks. Lawson State’s construction technology programs specialize in air conditioning and refrigeration, plumbing, and building construction. The plumbing apprentice/coursework program prepares students for State of Alabama journey licensing. J.F. Drake State’s technical, vocational and industrial career-training programs culminate in a certificate or, for those seeking a degree option, an associate of applied science. Through its five career divisions, Drake State vocational academics prepare students in business and Information technology, culinary arts/hospitality services management, engineering technology, health sciences, and manufacturing/applied technology. Health sciences is one of the school’s largest divisions and its newest program in medical assisting prepares students to take jobs in medical clinics or private physician’s offices. Within the engineering technology division, classes prepare students in architectural or mechanical drawing and design, robotics operations, computer hardware and industrial systems. Students in Alabama can start working toward their trade school credentials in high school or wait until their college years. While Alabama does have high schools specifically geared toward vocational training, traditional high school students may also earn career and technical education (CTE) credits through programs within their schools. College-level vocational and trade education is available through Alabama’s community college system, which includes four technical colleges. Alabama also offers career training through workforce development programs catered to adult learners. This search tool can help prospective students in Alabama find the right vocational and trade school that meets their needs. Pike County High School Business and Finance Academy has a replica of a local bank inside where student work alongside bank employees to gain practical work skills in a realistic setting. Alabama offers a total of 81 career pathways that stem from 16 national career clusters. Alabama’s technical skill attainment core indicator for postsecondary students exceeded the national average by nearly 12 percent in the 2013-2014 school year. Male and female enrollment in Alabama’s vocational and trade programs during the 2013-2014 school year were almost evenly split; slightly more males were enrolled in secondary programs and slightly more females were enrolled in postsecondary programs. Most vocational and trade students in Alabama choose to earn associate degrees rather than simple certificate-based training. Alabama encourages high school students to continue their vocational educations at local community colleges by offering dual enrollment programs to high school students. Alabama’s continuing efforts to expand workforce initiatives has led to workforce partnerships with local community colleges including the Alabama Technology Network and the Alabama Industrial Training Institute. Vocational students in Birmingham have a variety of options to choose from when selecting a career school. Lawson State, Jefferson State and the Alabama Technology Network prepare students for technical jobs in Alabama. The Alabama Technology Network joined Alabama’s community college system in 2004 as one of the state’s workforce initiatives, increasing accessibility to specific career and technical training. Birmingham’s in-demand careers for vocational graduates match those for the state as a whole, so students who go into health sciences programs should have the best career opportunities in the city. Health sciences jobs are expected to increase by about 30 percent on average each year until 2022, ensuring plenty of job openings for new graduates. Medical and clinical lab technicians, medical equipment repairers, cardiovascular technologists and HVAC technicians and installers are also at the top of the list of hot careers in Birmingham. An association that supports and advocates for the advance of career and technical education in Alabama. Provides resources and information about CTE benefits, practices and legislation. Alabama’s hub for vocational and trade school information, especially at the secondary level. A resource for current and prospective students wanting to learn more about CTE offerings in Alabama. Provides information about CTE at the postsecondary level through Alabama’s community college system. Provides information about employment laws and trends and a resource for job seekers in Alabama. Online job search tool for Alabama residents. Includes resources for education and training to get employed. Alabama’s official education website. Provides information on various schools and programs within the Alabama high school system.